A nosebleed, also known as epistaxis , is the common occurrence of bleeding from the nose. 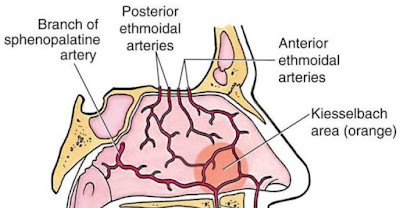 The nasal septum has a rich supply of blood from several arteries: ethmoid, palatine ad sphenopalatine arteries. The level of seriousness depends on various factors like location, frequency, etc. There are two types of nose bleeds, i.e. anterior nose bleed and posterior nose bleed. Anterior nose bleed occurs when the blood vessels in the front part tend to rupture. Whereas, the posterior nose bleed occurs when the blood vessels that are slightly closer to the throat get ruptured. The bleeding in this case may continue upto 20 minutes. Anterior nose bleeding is much more common and can be cured with home remedies, while posterior nose bleeding may need medical attention. So, if you experience nose bleeding frequently, these home remedies are tailor-made for you. The anterior and inferior part of the nasal septum (Little area or Kiesselbach area) has a dense blood supply but very thin mucosa. Trauma and dry air make this area, the commonest site (90%) for nose bleeds. 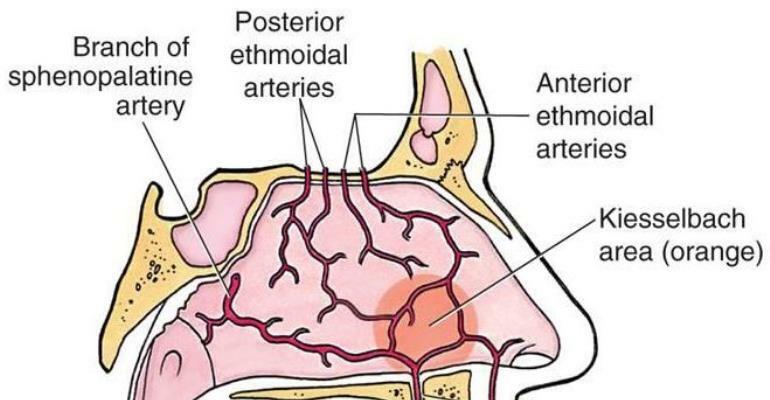 About 10% of nose bleeds are from the posterior middle turbinate, an area richly supplied with blood from the sphenopalatine artery. Bleeding, usually, occurs from a single nostril. Blood may drip into the throat and stomach and affected persons may spit up or vomit blood. Low environmental humidity, especially during the winter and harmattan period, have been associated with increased frequency of nosebleeds. Other conditions that obstruct normal airflow, including deviated nasal septum, lead to drying and irritation and hence recurrent nosebleed. Blood coagulation defects, including platelets disorders may cause recurrent nosebleeds. These basic and usual ways to stop sudden nose bleeding can come handy. Here's what you should do immediately. One of the most effective remedies for nose bleeding included cold compress. Holding a cold compress against your nose for a few minutes can help constrict the tiny blood vessels in your nose that are bleeding. The coldness will encourage the nose's interior blood vessels to narrow. The easiest way is to pinch your nose as it sends pressure to the bleeding point in the nasal septum that helps the blood to stop flowing immediately. All you need to do is to sit straight with your head tilted slightly forward. Using your thumb and index finger, pinch the soft part of your nose. Do this for about five to 10 minutes. Make sure you are breathing from your mouth. Release the pressure gently and sit quietly for about five minutes. Repeat till the blood doesn't stop flowing. Here are a few kitchen ingredients that may help stop the nose from bleeding. Vitamin K rich foods like kale, spinach, mustard greens, broccoli, cabbage, et al are involved in the formation of collagen that helps in creating a moist lining inside your nose. 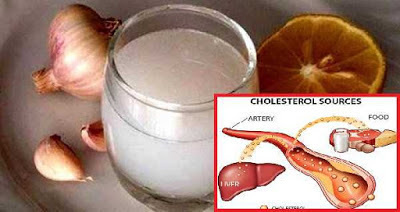 This vitamin helps keep the blood vessels in good condition preventing them from rupturing easily. For a long-term cure, loading up on vitamin K-rich foods helps a lot. Green leafy vegetables facilitate blood clotting. Getting enough vitamin C foods say oranges etc,. on a daily basis may help make the blood vessels stronger so they are less vulnerable to rupture and cause a nose bleed. Note: Vitamins C and K are long- term relievers and cannot provide an immediate relief. Home remedies for nose bleeding: vitamin C foods may help make the blood vessels stronger. One of the best home remedies is apple cider vinegar as the acid in the vinegar helps constrict the blood vessels, thus stopping the bleeding. All you need to do is to dip a cotton ball in the vinegar and place it in the affected nostril for about five to 10 minutes. This remedy should work in the first attempt itself. Dryness in the nasal membranes, especially during winters is one of the most common causes of nose bleeding. In order to solve this problem, soothe and moisturise the nasal membranes with saline water. Take a bowl, add some water to it and stir it well. Put a few drops of this solution in your nose to moisten the inner lining of the nasal passages. Cayenne works as a cell stimulant and regulates the pressure of the blood flow, which means it helps get rid of the heavy pressure from the haemorrhaging area. Take a teaspoon of cayenne powder and mix in warm water and drink up as soon as the bleeding starts. It is said that it helps stop the blood immediately. 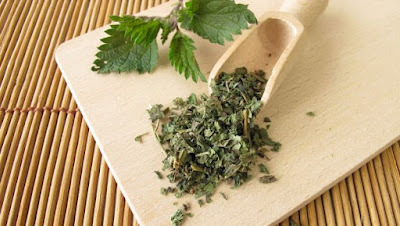 Nettle leaf is a herbal remedy that works well as it is a natural astringent and a haemostatic agent. Nettle solution helps keep allergy-related nose bleeds at bay. Brew fresh nettle leaf tea. Once it has cooled down, dip the cotton pad in the solution and place it on the nose; keep it for five to 10 minutes until the bleeding stops. Lack of liquid intake through the day can lead to dryness in the mucous membranes causing nose bleeds. Make sure you load up on enough water through the day. According to the book 'Home Doctor, Natural Healing with Herbs, Condiments and Spices' by Dr. P.S. Phadke, "For nose bleeds, one must try loading up on coriander leaves, mango blossoms and juice of the soft kernel of a ripe mango seed." How to prevent the nose from bleeding again? Repeat the steps above on how to stop the common nosebleed. If bleeding persists, call the doctor and/or visit to the nearest emergency department.